Amidst the glorious cinematic kinetics which makes P.T. Anderson the most enjoyable of contemporary directors, Phantom Thread is a softer step taken when matched with the filmmaker’s historical march. Speaking to the aesthetic first, it is not so self-involved with painting majestic cinematic sequences of human vivacity. I find this to be disappointing, as the commotion he so elegantly is able to capture in most of his scenes is delectable; albeit perhaps tried at this point and no longer worthy of a challenge. The story, here, and character development, are what Mr. Anderson is vying to master. And he accomplishes the task extraordinarily – better than most novelists whom have far greater capaciousness to elaborate their characters. Cinema, because of its visual primacy, presents a challenge to generate complex drama which is not soporific. Perhaps this limits its spectrum to solely dealing with the eccentric – and yet the oddballs themselves, by being so far flung from the norm, can themselves provide a mirror reflection on one’s own humanity. Unsettling motion of buttering morning bread can be taken deathly seriously, which is humorous but also thought provoking on how important a good start to the morning is in foretelling the outcome of the day. Mr. Anderson was more than up to the role of threading a drama with a subdued performance by the always incredible Mr. Daniel Day-Lewis. In the most esoteric of human realities of all places – bespoken couture to the European upper crust – the drama is allowed to flourish. Snippets of this intriguing man who is the fashion designer to European aristocracy are interwoven with his foraging for a submissive woman for an intimate relationship, but more in appearance as a pseudo-concubine. What Mr. Anderson does so wonderfully is hide the depths of each character’s intimations, and with each one being ferociously scripted independently, the surfacing of their deepness comes as a surprise to the audience as it is unraveled phenomenally on screen. The end result is a two-hour drama about a post war British fashion designer which nary casts a yawn. And in writing such an idiosyncratic tale, we are left with characters who act with such glaring breaks from generic narratives; it is enjoyable in itself. Stereotypical plots which plod along are banal – it is in the crafting of characters which act unpredictable to us where the plot feels alive. It raises a genuine question of how faulty our assumptions are of the closest people that we know. Do we, in fact, really know their depth, or are we just satisfied in grasping what is conveniently superficial? 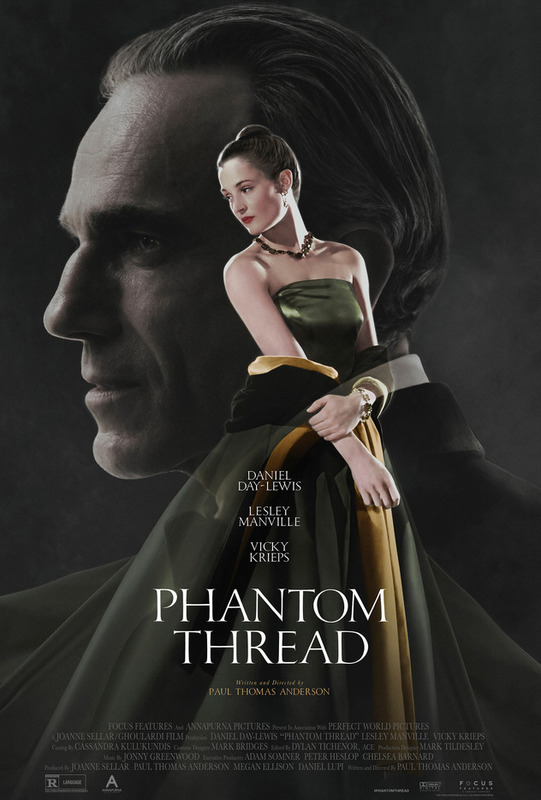 Consider Phantom Thread the paragon of character study and another master stroke by a brilliant filmmaker. If only the talents of Mr. Anderson were more commonly expressed!